During late spring in the Sage Hills, the wide open sunny slopes are colored with a blue-to-purple hue. The flowers are lupines, a common shrub-steppe wildflower. Lupine can be recognized by its tall, spike-like cluster of blossoms. The flower itself has two lips that look, from the side view, like a parrot’s beak. The lupine leaf is palmate with five or more leaflets radiating outward from a single point on the stalk. The stalks are silvery to slightly rust colored from the dense covering of hairs. Silky lupines are more robust, and grow one to three feet tall. Leaflets are one to four inches long, and the flowering stems jut up above the leaves. It can be distinguished from sulphur lupine by the absence of a dense basal cluster of leaves and a strikingly hairy appearance. Silky lupine tends to bloom after the sulphur lupine. Sulphur lupines are somewhat shorter (one to two feet tall) than silky lupine with smaller leaflets (one to two inches long). The flower stalks are shorter and more integrated with the leaf stalks, and the flowers themselves are also smaller. In some areas, sulphur lupine will have white (cream-colored) or pale yellow flowers, but in the Sage Hills this sub-species has purple flowers like the silky lupine. It can be distinguished from silky lupine by the dense basal cluster of leaves. 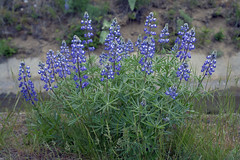 Sulphur lupine generally blooms before silky lupine. Within the roots of many legumes, including lupine, are nodules that house symbiotic bacteria. These bacteria contribute to healthy ecosystems by converting nitrogen from the atmosphere into forms plants can use. Scientists have discovered that lupine can nearly double the amount of nitrogen in soils, which is important for our own local nitrogen-deficient soils. Lupines contain toxic alkaloids and can be very poisonous, although large quantities of the plant material must be ingested in a short time to cause death. Symptoms of lupine poisoning include dizziness and lack of coordination. Native Americans used lupine as a natural dye.